Custom-made pocketknives are a great gift for someone special including yourself! There are tons of pocketknives on the market today targeting every demographic with every type of custom design you could imagine. Still, there is something unique about adding a personal touch. For example, an engraving or placement of a gemstone is great if you are presenting a pocket knife as a gift. In addition, with today’s technology just about anything can be added to a knife blade or handle such as company logos, names, artwork, or inspiriting messages. There are a number of merchants who can provide this type of service for you. The expense is generally reasonable depending on the type of knife and custom design. What better way for the groom to show appreciation to his groomsmen than with a custom made pocket knife engraved with their name and a heartfelt message? Prior to being introduced into the “real world,” a young graduate may really appreciate a good pocket knife. Moreover, a custom-made pocket knife will probably be taken care of better and not lost. A company can reward their staff for doing a good job with a custom-made pocket knife engraved with the company name or an appreciative message. Give someone a custom-made pocketknife with a message offering best wishes. Perhaps you know someone starting a new job, or going on an excursion. There are plenty of reasons to offer someone best wishes. Dads fall in love with their pocketknives. It reminds them of when they were a kid, or perhaps they have a current hobby where a pocketknife would come in handy. Either way, it will serve him well and put a smile on his face for many years to come. Why not offer a family member or friend a custom-made pocketknife before being off on that long summer camping trip? A pocketknife with a laudatory message such as “To a Great Sport” would be very welcomed. Well, why not? This is the 21st century and women are as active as ever! A custom-made pocketknife with a pink heart and a lovely message is a beautiful gesture. Especially if she is the outdoors type, or has a hobby that requires use of such a tool. Just about every pocketknife can be customized in some way; however, there are some pocketknives that look more impressionable than others when a bit of customization is applied. There are certainly enough merchants offering their “customized” touch, but many offer cheap, worthless crap that is not worth recommending to anyone! The idea of having something customized, even if it is a pocketknife, is because you want it to look special. It can be reasonably priced and still exude quality. Spending your money on a quality pocketknife from a trustworthy brand will last the recipient a lifetime. Here are five top quality, reasonably priced pocketknives that are ideal for customizing. A favored stylish men’s pocketknife for engraving is the Buck Noblemen. The steel drop-point blade a bit more than two and a half inches and very sharp right out of the box. 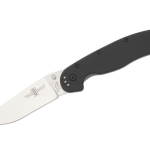 In general, a fine looking quality pocketknife that is reasonably priced as well. The traditional Swiss Army Knife is a world-renowned pocketknife that is used by many. It’s an ideal gift for men or women with hundreds of models to choose from. However, this specific model is ideal for engraving due to its brushed stainless steel body and classy appearance. This pocketknife is Swiss made, practical, and you can’t beat the price. Fantastic quality, superior design, and affordable is what describes the Spyderco Dragonfly stainless steel model VG-10.The stainless steel blade is great for customizing and will be much appreciated. SOG is a fine knife manufacturer, and the Twitch II always manages to score at the top in user reviews. 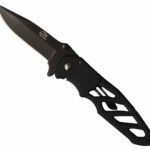 It incorporates an AUS-8 stainless steel blade just over two and half inches and a locking feature that is very dependable. Customization can be completed on the anodized aluminum handle. The Buck 110 is an American made classic and the most imitated hunting knife around the world. It has long been a mainstay with huntsmen, fishermen, and campers alike. The blade is perfect for customizing and the Buck 110 is reasonably priced as well. If you are going to buy a personalized pocket knife of any variety, I highly recommend getting it at Knife Depot. They have a huge selection of models to choose from and top notch service!